Virtualization brings manifold benefits to organizations such as better hardware utilization, cost savings and flexibility in business operations. However, this new technology with all of its added benefits still has inherent risks. Also, since virtualization is deployed across computer-based systems, securing the environment is a key priority. 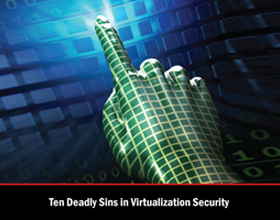 This paper looks at the ten deadly sins of virtualization security.